There are many things to love about our community, and one of them is our local DurangoTV.com. 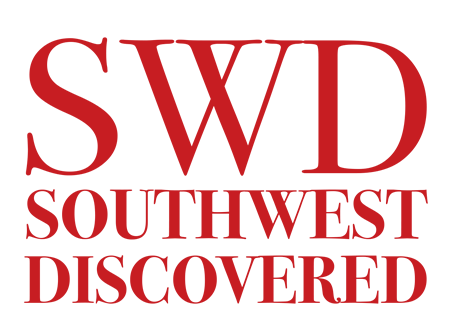 It’s a cable channel that highlights the culture, lifestyle, activities and attractions of Southwestern Colorado and the Four Corners area. This is how we came to discover the American Indian Cultural Arts Festival at the Aztec Ruins National Monument in Aztec, New Mexico. A charming little town about a 45 minute drive south from Durango, CO, this past Saturday was perfect for the drive down. Just in time! 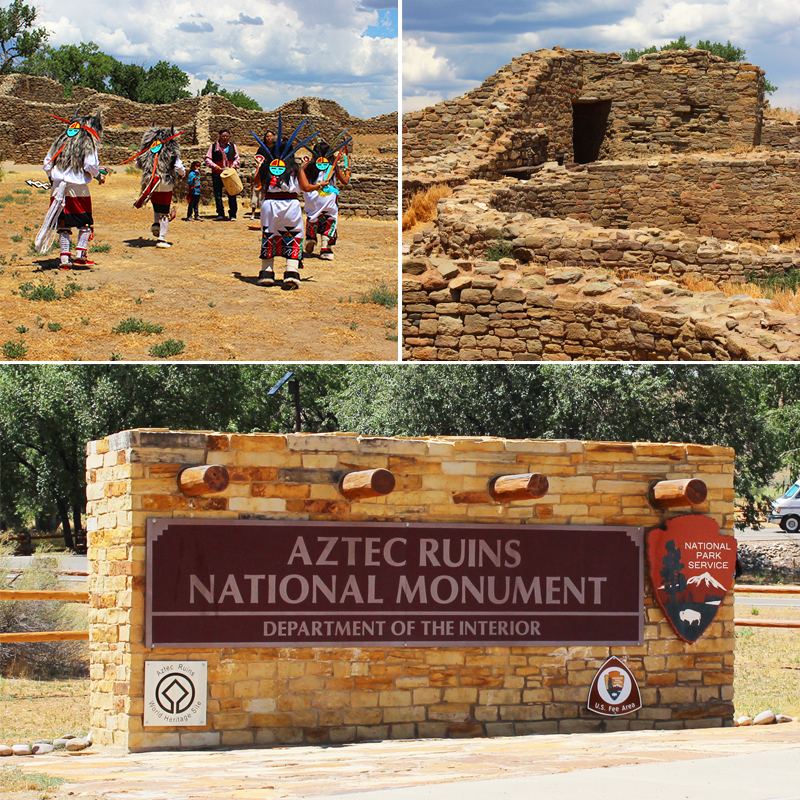 We were very fortunate to watch the Native American Dancers from the Acoma Pueblo demonstrating some of their dances in the main common area of the ruins. The Acoma Pueblo is known as the Sky City because it is built atop a sheer-walled 367-foot sandstone bluff. Since 1150 A.D., Acoma Pueblo has earned the reputation as the oldest continuously inhabited community in North America. The mesa-top settlement is known worldwide for its unique art and rich culture, and is located roughly 1 hour and 30 minutes southwest from Albuquerque, NM. Directions can be found here. 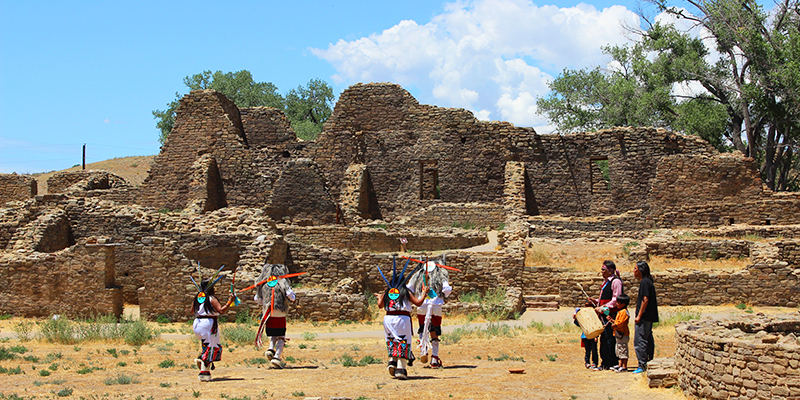 What an amazing setting, to be standing among the 900 year old Ancesteral Puebloan buildings of the Aztec Ruins and watch the Acoma Dancers in their amazing Native outfits. And on this day it was open to the public, so it was a wonderful bonus to walk among the dwellings listening to the music of the dancers. For more info and video links about the Aztec Ruins, click here. This was all a part of their 2nd annual American Indian Cultural Arts Festival. It was an event that showcased nationally renowned Native American artists and their mentors from the N.A.T.I.V.E. Project, a program that assists artists in turning their talent into a life-supporting business. On hand were beautiful sand paintings by a master artist, exquisite turquoise jewelry and silver works, paintings, and more. As we walked through to admire the artwork, we smelled the delicious aroma of Navajo tacos and fry bread. One booth offered large round loaves of bread baked in an horno oven, home baked pies and cinnamon cookies. We were sure to ask permission to video and photograph the dancers. We wish we could show you the wonderful artwork, but photography was not allowed in that area, so you might want to make a note to check the Aztec Ruins calendar for July of 2018 — this festival is something not to be missed. One Day Left on our Summer Giveaway! Just the name “Aztec” has a special mystery about it — thank you! Ms.M, it is a very special place and many people feel a spiritual connection there, particularly in the great kiva where ceremonies and celebrations were / are held. What a wonderful discovery. Is an Acoma Pueblo article in the works? Paul, Acoma is high on our list for an autumn discovery. So stay tuned! I love this article in support of young artists, and the new video feature, thank you. I applaud the coordinators of this this festival and the mentors. Also, everyone should see the Aztec Ruins at some point in their lives. ChileSage, Programs like these make all the difference for these young artists. This festival, with the backdrop of the Aztec Ruins, made it all the more special. Thanks for the comment, we could not agree more. I wish I’d been there. I’ve marked my calendar to check next year. Also, I liked your post about Aztec Ruins very much. Carmen, thank you! And if you make it next year, please send pics and we’ll share them with everyone! Every week you surprise us with new discoveries and video. Loved loved this post. Joanne, we pinch ourselves that we live so close to these amazing events and national monuments / parks. Thank you for the comment!